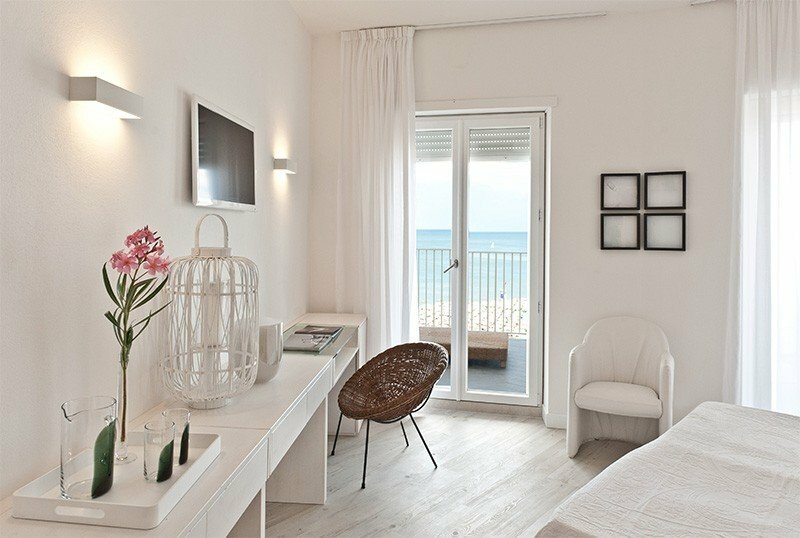 The Hotel Torremaura is a 4-star family-run hotel in Milano Marittima, located directly opposite the beach and less than 5 minutes from the pine grove. It has parking, swimming pool, Jacuzzi and beach service included. Pets Allowed. The hotel is located on the seafront of Milano Marittima with direct access to the beach, with no roads to cross. Behind it is the centuries-old pine wood, reachable in less than 5 minutes on foot. The city center is a 20-minute walk or alternatively a 5-minute drive. All rooms have balconies, with sea or pine trees, air conditioning, free WI-FI, sommier beds, telephone, satellite TV and digital terrestrial, safe, minibar and private bathroom with hairdryer. RELAX ROOMS : from 19 to 25 square meters, furnished in natural wood and with soft lighting, they are equipped with a large terrace and shower. FAMILY ROOM : 40 square meters, ideal for families with children, is composed of two communicating Relaxing rooms, each with its own bathroom. EXCLUSIVE ROOMS : from 19 to 25 square meters, bright and elegant, are located on the third and fourth floors and are equipped with all the amenities listed. DELUXE ROOMS : from 20 to 25 square meters, they are completely soundproofed and equipped with 32 '' TV, bathroom with large shower box and balcony with sea view. JUNIOR SUITE : from 23 to 27 square meters, spacious, comfortable and elegant, they are located on the attic floor and have 32 '' satellite TV, sitting area, large and comfortable bathrooms with bath or shower. MI.MA SUITE : 65 sqm, apartments consisting of a living room, two bedrooms and two bathrooms with emotional tub with aromatherapy, music therapy and color therapy, private solarium and large terrace. Garden, open-air porch, terrace, outdoor pool with Jacuzzi, playgrounds, wellness areas, gym and beach club. Inside there is a reading room with newspapers and paid laundry service. The staff organizes theme nights. PARKING: uncovered and available to all customers. CONVENTIONS : beach, amusement parks, discos, gym, organized excursions. LUNCH AND DINNER : 3 choice menus served in the beachfront restaurant, with dishes from Romagna and Italy based on genuine ingredients, homemade pasta and desserts. VARIATIONS : vegetarian, vegan cuisine. In hotel : strollers on request, swimming pool for children and baby / mini / junior club. Baby sitter and pediatrician services are available upon request at an extra cost. At meals : seats at the table, bottle warmers, baby food, baby menu, afternoon snack. On the beach : playground, entertainment service. The structure has a 40 square meter swimming pool, "Champagne Pool" with an adjustable temperature up to 30 degrees and a system for sanitizing mineral salts. Around the pool is the solarium area with sun beds and a Jacuzzi will be available to guests, along with a room for massages (Ayurvedic, draining, relaxing and sports) and beauty treatments. The hotel is ideal for sports lovers. Offers special rates for the Adriatic Golf Club. Milano Marittima also boasts a sailing club where there are sailing, canoeing, windsurfing, water skiing, catamaran, aquagym and swimming schools. Close to the structure there are cycling routes to discover the pine grove and the hinterland. The hotel has an agreement with the Aquamarina Village beach (born from the union of the Bagno Dario and Bagno del Pino bathing establishments). The beach is equipped for animals and has games and clubs for children, sunbeds, beach umbrella, cabins and beach volleyball courts, beach basketball and beach tennis, as well as wellness spaces, music and parties during the summer. Beach service (1 umbrella + 2 beds per room) included for a minimum stay of 5 nights for Deluxe Rooms, Junior Suites and Suites. TOURIST TAX: excluded. € 2.00 per person per day (from 01/04 to 31/05 and from 01/09 to 30/09), € 2.50 per person per day (from 01/06 to 31/08) for a maximum of 7 nights consecutive, excluding minors up to 14 years.